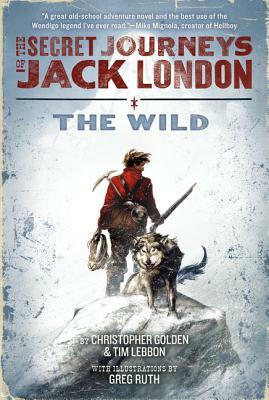 The world knows Jack London as a writer who lived his own real-life adventures. But there are some parts of his life that have remained hidden for many years, things even he couldn’t set down in writing. Terrifying, mysterious, bizarre, and magical—these are the Secret Journeys of Jack London. Jack, age seventeen, journeys far into the Yukon Territory in search of gold and adventure. But what he finds in the wild reaches of the north freezes his blood: kidnapping and slavery, the murderous nature of desperate men, and, amidst it all, supernatural beasts of the wilderness that prey on the weakness in men’s hearts. Jack’s survival will depend on his ability to quell the demons within himself as much as those without. Christopher Golden is the New York Times bestselling author of such novels as Of Saints and Shadows, The Myth Hunters, Snowblind, Ararat, and Strangewood. With Mike Mignola, he co-created the comic book series Baltimore and Joe Golem: Occult Detective. He lives in Bradford, Massachusetts. Greg Ruth (Illustrator) has created countless comic books for Dark Horse and other publishers, and has worked on videos for Prince and Rob Thomas, among others. He has also illustrated many children’s books as well as graphic novels. He lives with his family in Massachusetts. Tim Lebbon has written more than forty horror, dark fantasy, and tie-in novels, including The Silence, Relics, Kong: Skull Island, and the Noreela fantasy series. He’s also written hundreds of novellas and short stories, winning several prestigious awards, and has had his work optioned and made for the big screen. He lives in Monmouthshire, UK. A rollicking adventure tale for modern-day readers, depicting with great awe the unforgiving, and yet beautiful, conditions Jack confronts. There is enough biographical reality to drive curious readers into sampling the works of the actual London while they eagerly await another chapter. That is a fire worth starting. Golden and Lebbon write with a gritty assurance that brings the fantasy elements-most notably, Jack’s multiple face-offs with the mythic Wendigo-down to earth. This first chapter kicks the door open for almost anything in book two.